American Horror Story: Freak Show is the highly anticipated fourth season of the American Horror Story series and is set to be the most terrifying season yet. 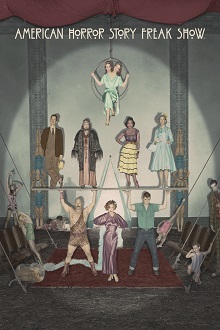 Recently honoured with two Primetime Emmy Awards, the latest instalment American Horror Story: Freak Show begins its tale in the quiet, sleepy hamlet of Jupiter, Florida. The year is 1952 and a troupe of curiosities has just arrived in town, coinciding with the strange emergence of a dark entity that savagely threatens the lives of townsfolk and freaks alike. This is the story of the performers and their desperate journey of survival amidst the dying world of the American carny experience. Returning for another season are 2014 Emmy Award winning actors, Jessica Lange – in her American Horror Story series swan song, and Kathy Bates, as well as a multitude of guest stars including Matt Bomer (White Collar), Wes Bentley (The Hunger Games) and legendary singer, Patti LaBelle.